I wonder if the Goshawks nest somewhere nearby? I have a memorable childhood photo somewhere (on the old 'film') of a female Brown Goshawk zeroing in on me, as I was sitting in a tree right beside her nest! It wasn't a place I stayed very long, let me say, with one very angry mother attacking me. She didn't like the idea of me trying to get close-ups of her nest and eggs. It's conceivable that they might nest in the nearby small Blue Gum plantation. However, I think this youngster is attracted by the variety of birds and vermin that the area appears to support. I'm not sure that a nesting pair of any raptor would take kindly to the presence of a competitor. 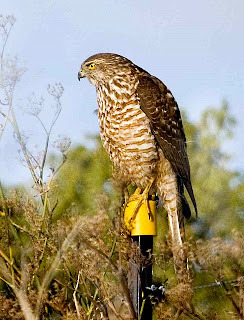 I've noted a similar, young Brown Goshawk that "terrorises" the local bird population at Kingston. It also seems to be drawn by the large number of birds attracted in turn by hand feeding by locals. I think that surviving their first Winter is difficult for many birds, but especially so for raptors. The Sorell bird still seems to have to put in a lot of effort for a feed. I'm surprised that it hasn't shown any evidence of moulting into adult plumage yet. I find juvenile raptors a joy to photograph - the young ones almost sit and smile at the camera. As the weeks go the young Brown Goshawk especially, becomes more wary of a human presence, until sightings become rare and fleeting. I have yet to photograph an adult Brown Goshawk, as any thing but a gray/brown blur destined for the computers trash. I thought my luck had changed at the weekend when I recorded an obliging subject seemingly in adult B.Goshawk plumage - I'm fairly certain however it was a collared sparrowhawk, which would explain the more amenable behaviour. On the same day I also sighted a small raptor, pale sandy colour underneath, square, shortish tail, with a prominant black band across the bottom. Could this have been a Nankeen Kestrel? I must say that the Sorell Brown Goshawk has given me a few photo opps! But I've yet to get as close as I would wish, photographically speaking. I've yet to photograph a Collared Sparrowhawk, and they seem to be a bit thin on the ground, although their habitat choice of more densely wooded areas, possibly accounts for some of this. Your unIDed raptor sounds like a possible Nankeen Kestrel, a rarity in the south of Tasmania. You'd better tell us where you saw it!!! A single Kestrel overwintered regularly at Sorell many years ago, taking up residency at a wheat store, now converted into a machinery shed. Mice seemed to be the main prey, swallowed whole. It was very easy to approach. to sit rather than flee - I have managed to photograph a Peregrine Falcon and Collared Sparrowhawk here. Needless to say my camera and binos were several hundred metres away when I sighted the bird in question. I shall have to be more vigilant! Great photos as usual. Sounds like an interesting spot. May I ask, what street/road does one access 'Waterview Sanctuary' from? I cannot find it on a map. Waterview Sanctuary is off the highway through Sorell. After the Sorell Causeway, you will see a sign on the right indicating the chicken processors, turn right at the next right (Giblin Drive), right on the bend. In less than 100 metres, the road bears sharp left, but you need to go straight ahead past the recycling centre. and 50 metres or so past that is a barrier and a turning circle, usually muddy!! Park there, keeping the turning circle clear if possible. You will see the sign indicating the site. The sanctuary and the adjoining area only amount to a few acres. 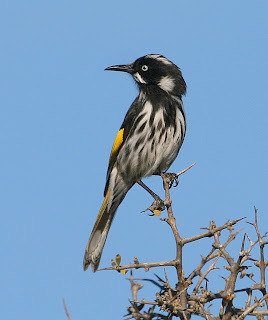 It was set aside mainly for viewing waders, but native shrubs planted there by BOAT, (now Birds Tasmania), and Sorell School, attract a range of birds as per the blogs. It's not the most salubrious of birding spots, but on a good day, you can rack up a good range of species. Thanks for that. I've copied your directions for the next time I'm down that way.